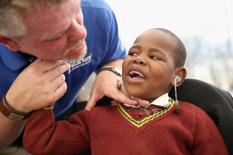 Starkey Hearing Foundation (SHF) is dedicated to building better lives for hearing-impaired people around the world. William F. Austin, founder and CEO of Starkey Hearing Technologies founded SHF in 1984, after having successfully run his profitable hearing aid company since 1967. He founded it with his wife Tani Austin, with a mission to spend his earnings by giving back -- where his hearing aid company supplies the hearing aids. Their goal: Help one million people to hear by 2020. So far, nearly 500,000 hearing aids have been distributed around the globe. The work started in the US, but hearing loss knowsnoborders. The foundation soon expanded into Central America, South America and beyond, and has provided hearing care to more than 110 countries. Currently, it fits more than 100,000 hearing aids annually. Hearing loss impacts 1 in 10 Americans, and 63 million children worldwide, yet many do not have access to the hearing devices that can help them. Since 1984, SHF has promoted hearing care awareness through the support of hearing research, education, and charitable programs. SHF's mission is to change the social consciousness of hearing and hearing matters through education and research -- while providing the gift of hearing to those in need around the world. Each year, SHF donates thousands of free hearing aids to needy individuals and children.Through gifts of time, money, products, and materials, these international outreach programs have improved countless lives. In addition to philanthropic endeavors, SHF provides support and sponsorship for several industry-level public awareness campaigns. SHF has been working toward bringing about an understanding among people through hearing care by focusing on awareness, education, protection, and treatment, so thatthe world may hear. Founder Bill Austin's experience in hearing aid distribution and repair led him to create the concept of comprehensive hearing solutions. Austin's focus on customer satisfaction and quality of life revolutionized the industry by setting a new standard for innovation and service. The Austin couple travel around the world for ten months per year to fit the hearing impaired with hearing aids. Last year,SHF fit 165,000 free hearing aids topeople in India and The Bronx -- from New Orleans to New Guinea. SHF founders say Hearing is very emotional; it is the road to the heart.Most of the world's deaf are merely hearing impaired, but can do nothing about it. During arecent visit to Angkor Wat in Cambodia, Tani Austin fita12-year-oldgirl Sarien, with powerful hearing aids to see whether she could get her to respond. Her mother said she was completely deaf. With the hearing aid on, though, Sarien could hear sounds and tried desperately to make sounds for the first time in her life. More than 400 faces heard sounds for the first time in their lives in Angkor Wat during SHF's camp. SHF sends families home with a year's worth of batteries and local contacts for help, and there are no strings attached to it. At SHF, they use hearing as a vehicle to reflect careand improve the lives of individuals, families, and communities around the world. By providing the gift of hearing and showing people in need that they care about them, they are hoping to help them achieve their full potential. They want to empower them and give them hope for a better life, which, in turn, gives them the opportunity to do the same for others. SHF receives no government funding. It works on donations, volunteers, and support from individuals. Hear Now - Hear Now is committed to assisting US residents with hearing loss, who have no resources to acquire hearing aids. Started in early 1988 by Dr. Bernice Dinner, Hear Now officially became part of the Starkey Hearing Foundation in 1999 to meet the growing demand for hearing help. SHF provides the hearing aids and runs the program, but the foundation counts on the generosity of "Hear Now" providers and donors across the country to ensure its success. With its extensive international mission schedule, SHF has provided more hearing help to people in the US than to any other country. They do this through domestic hearing missions and the daily efforts of "Hear Now". Each person the foundation helps is fit with brand new, top-of-the-line digital hearing aids that are customized to their hearing loss. 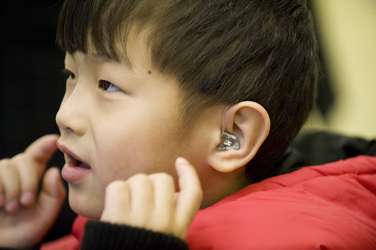 Since 1999, SHF has provided hearing aids to more than 50,000 people through the program. into practice. 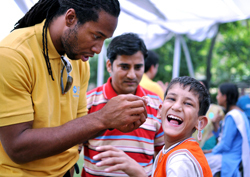 A number of celebrities, including Miley Cyrus, Jordin Sparks, and Larry Fitzgerald, have joined Starkey Hearing Foundation's Listen Carefully program to spread the word and to let people know that the majority of hearing loss can be prevented through simple daily actions, such aslowering the volume on an iPod or using earplugs at a concert. Through the "Vow to Act" people can commit to taking measures to protect their hearing, and encourage friends and family to do the same. In May 2012, SHF partnered with Scholastic, Inc. to further educate young people on the issue, and have potentially reached more than 500,000 students through thenationallyaccredited teaching guide. Hearing Aid Recycling - SHF has an international outreach system under the "Hear Now" program, whereby the foundation collects hearing aids for recycling purposes. Any make or model, regardless of age, can be donated to the hearing aid recycling program. These hearing aids are refurbished, wherever needed, and provided to those in need and are unable to afford it. The "Repair Department" at Starkey Hearing Technologies is the primary supporter of the foundation's Hearing Aid Recycling program. The department recycled its 75,000th hearing aid last year. The donations under the recycling program help supply many of the hearing aids that go on the international missions, and have helped provide opportunities to thousands across the globe. SHF is the global leader in the gift of hearing -- delivering 100,000 hearing aids annually through its hearing missions across 86 countries. SHF has touched countless number of lives through its missions and awareness programs. The foundation is sustained by the selfless efforts of its volunteers and donors spanning the globe. With a goal to heighten social consciousness on the importance of hearing, SHF has also launched a hearing conservation program "Sound Matters" to educate the public about responsible listening. One of the greatest challenges for all children with hearing loss is communication and connection with the rest of the world. Hearing is the foundation for building relationships, helping them connect with people and the world around them. Children with hearing loss often experience delayed development of speech, language, and cognitive skills. Listening and hearing are critical to education. Without the ability to hear teachers or classmates, hearing-impaired children struggle to learn and excel in the classroom. However, if these communication barriers are removed early enough, children with hearing loss can perform just as well as their peers. In addition to its work in the US, SHF has been focusing on developing countries, as it believes that the developed nations have tools and technologies readily available to remove the barriers and provide children, even with profound hearing loss, a chance at mainstream education. Unfortunately, in the developing nations, such as those in sub-Saharan Africa and parts of Southeast Asia, resources, education, and training are not easily available. 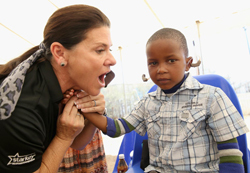 Many children lack access to basic medical care, let alone hearing aids. Children with hearing loss are often cast aside by society and thrown into deaf schools - when they are notactually deaf. They can be helped with hearing aids, if they have access to proper care. In many parts of sub-Saharan Africa, a vacuum exits in terms of hearing health resources. In Rwanda, for example, there are only three audiologists to serve the entire country, and 90% of the population is rural. For the few who are lucky enough to see one of these audiologists, the cheapest hearing aid available is $320, an unimaginable fortune for someone living on less than $1 per day. Even for those whohave money, it can be extremely difficult to access this type of technology in many countries. In Mek'ele, Ethiopia, two brothers travelled all the way from Addis Ababa because they could not even purchase the hearing aids there, if they wanted to, due to non-availability. In December 2013, SHF teams visited four countries and 10 cities, providing hearing aidto more than 12,000 people. Traversing acrossAsia, the foundation provided hearing aid to people in India, Cambodia, China, and completed its tour with an impactful four-city hearing mission in the Philippines. Typhoon Haiyan struck the Philippines in November 2013 before SHF's long-scheduled hearing mission was set to take place. SHF provided support and care to more than 5,000 people in need in the typhoon struck Philippines. Allocation of Expenses -- As per the audited financial statements for the year ended December 31, 2011, total support and revenue received by SHF stood at $25.2 million, against which, the total expenses stood at $24.6 mln. Of the total expenses, $15.4 million or 63% were toward program and service expenses, while $9.2 million was expended on support services, including fund raising activities that amounted to $5.3 mln. Nearly 37% or $9.1 million of the total expenses were toward hearing aid donations. Payroll-related expenses constituted 7.4% or $1.8 million, though the foundation uses a significant amount of volunteer and donor time for its hearing aid fitting missions. In addition to cash donations, SHF also accepts donations by way of hearing aids, supplies, space, and volunteer time to carry out its mission to create awareness as well as fit hearing aids. How one can help - Those who are interested in helping Starkey Hearing Foundation can contribute through a number of avenues. They can become a "Hearing Mission" sponsor and raise funds to attend a Hearing Mission, sponsor a future Hearing Mission recipient, recycle hearing instruments, volunteer time through the foundation's "Hear Now" program, or become a foundation partner.